Connie Dugas and her husband are all smiles after they found out she will take home the $1,000 bonus. When the smoke cleared it was Connie Dugas who put 269,000 in the bag to take home the chip lead here on day1b. 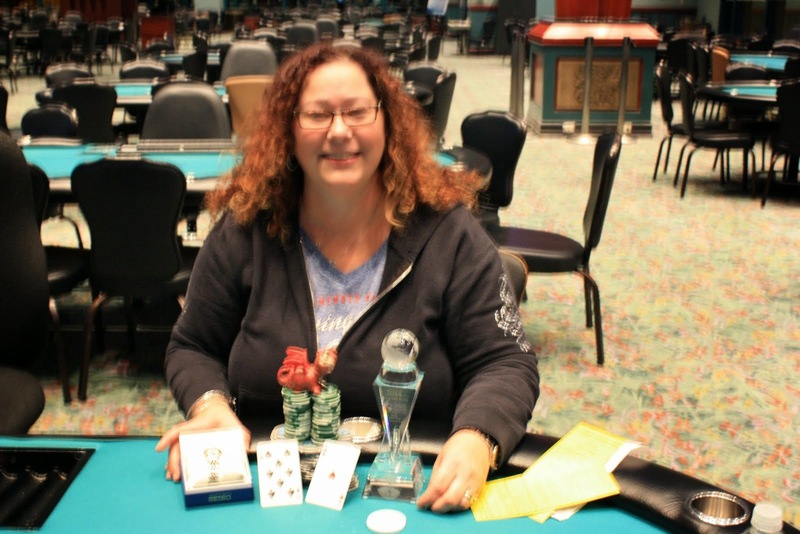 She will take home $1,000 for bagging the most chips. Other notables include James Campbell, Tarun G, Tim Lahey, and Mark Dube. 63 players survived and will be combining with the 27 from day 1a tomorrow at 11am. Tony Lanteri is our first player to crack 200,000. With the board reading [10s][10h][5s] a player from the big blind announced he was all in for his last 20,600. It folded to Tony Lanteri who made the call and the rest of the players folded. The turn was the [Qh] and Lanteri would need to dodge a queen or a spade to take down the pot. Sure enough a meaningless [4d] hit the river and Lanteri would rake in the pot. He is now our first player to cross the 200,000 chip mark and with only 1 level left in the night could potentially be the one to take home the $1,000 chip leader bonus. Anders Thurdin cracks the aces of Nick Palma. There will be no back to back victory for Nick Palma as Anders Thurdin just busted him. The action started with Palma raising from under the gun to 3800. Thurdin called on Palma's immediate left and the big blind also came along. The three saw a flop of [Kh][6h][5h] as the big blind checked to Palma who continued with a bet of 5,500. Thurdin quickly called and the big blind got out of the way. Palma showed no signs of slowing down on the [4s] turn as he bet again, this time for 11,000 only leaving himself an additional 11,000 behind. Thurdin quickly called again and the [7d] hit the river. Palma announced all in and Thuridin snap called tabling [7h][7s] for a rivered set. Palma looked shocked as he slowly turned over [Ah][Ad] and gathered his things quietly as he made his way out of the tournament area. And he hits 2 outer on river 7ball was so focused ahhh next one! Thurdin meanwhile is over 100,000. Flights day 1a and 1b have combined for a massive prize pool of $134,157. 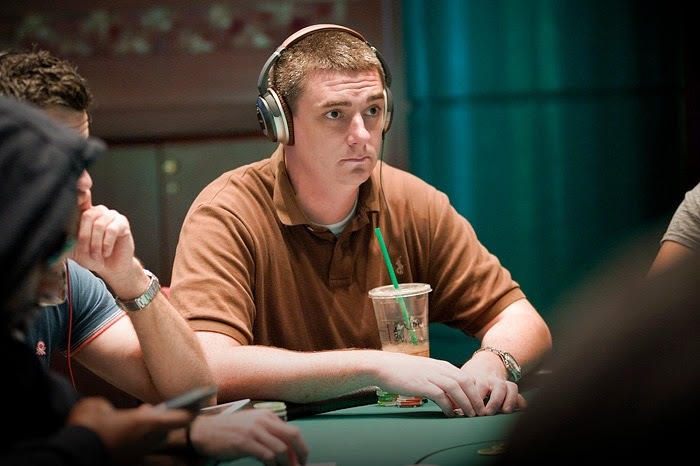 The top 45 players will make at least $804, but all of them have their eyes on the $29,072 and a Foxwoods globe! 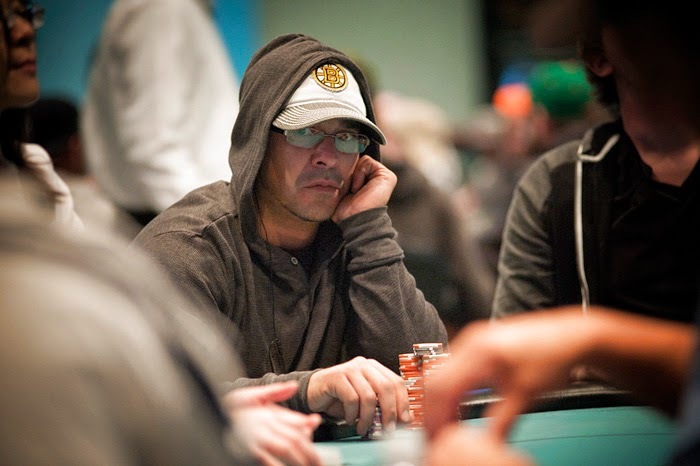 We walked up to the feature table to see Mark Dube deep in the tank with an opponent all in for 81,400. After counting down his stack numerous times Dube elected to call. It was a classic flip and we were off the races. The dealer spread a flop of [2d][2h][3d] and Dube sank into his chair as the other player stood up realizing he picked up the flush draw. Just like that the dealer burned and turned the [2s] and Dube improved to a full house, but still needed to dodge an ace or a king on the river. He did just that with the [3d] river and Dube raked in a massive pot. He now sits with over 180,000. Last table to break in the front of the tournament area. Tables are breaking left and right and players are now on their last break of the night. We are down to 100 players from the original 279 that took their shot today. Players will be returning to play through the end of level 15 and then will be bagging for the night. Both flights combine tomorrow morning at 11am to play down to a winner. 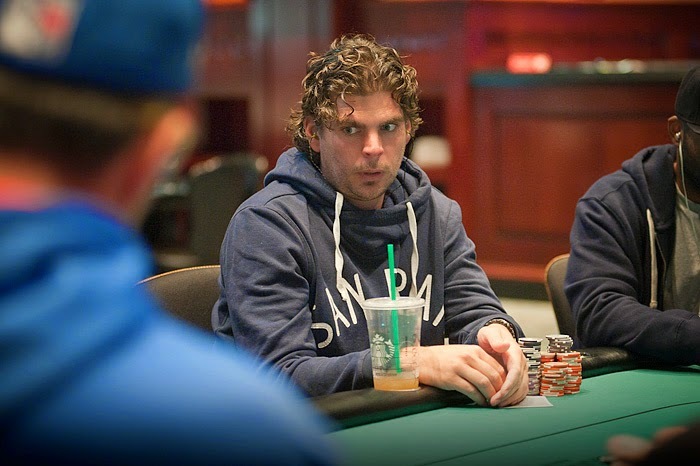 We caught up to the action on table x to see 3 players all in on a flop of [4h][9h][7d]. Jeremy Costa and Fabio Dagata were both of the players at risk. Dagata would need to dodge a 5 or a 10 to remain in the tournament and Costa would have to dodge a 5,10 or an ace. The board ran out [3h][8c] providing Costa with a triple up and new found life with 35,000 chips. 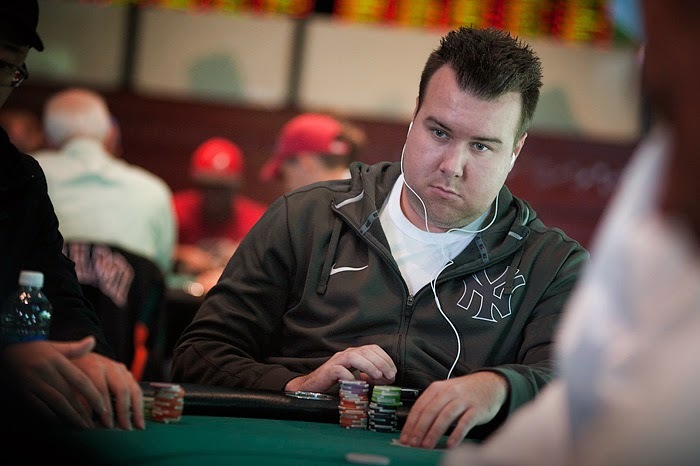 Dagata broke pretty close to even on the hand and still sits with around 22,000. The players are now in level 12 with the blinds at 600/1200/200. There will be a 10 minute break at the end of this level, and then players will return to play out the remaining 3 levels on the day. The action was on David Chaves facing a raise and a call in front of him. A player opened from under the gun +1 to 2,000 and the player on his immediate left had called. 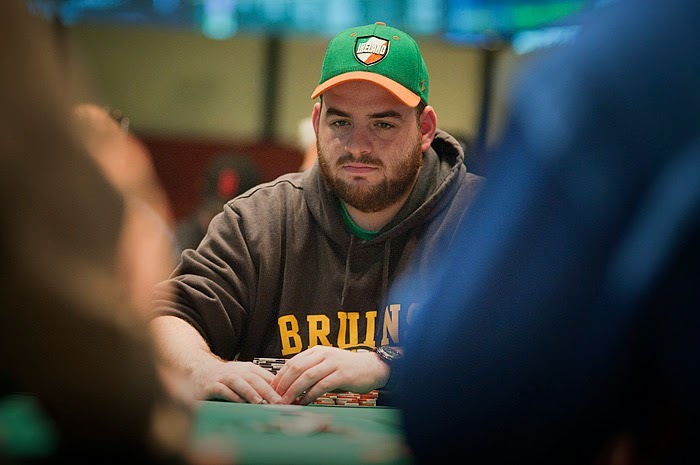 Chaves put in a three-bet to 4,400 and action folded around the original raiser who without hesitation announced he was all in for an additional 17,800. The player on his immediate left announced call leaving himself 12,000 behind and after a slight deliberation Chaves called as well. The dealer spread out the [Kc][10s][8c] flop and before his opponent could finish saying all in, Chaves quickly yelled "Call!" as he tabled [10h][10d] for middle set. Both of the other players shook their heads as they both tabled their hands. The board ran out [7h][Qs] and Chaves scooped the monster pot. He now sits with over 90,000 and may be the chip leader with a good shot of taking down the $1,000 chip leader bonus at the end of level 15. 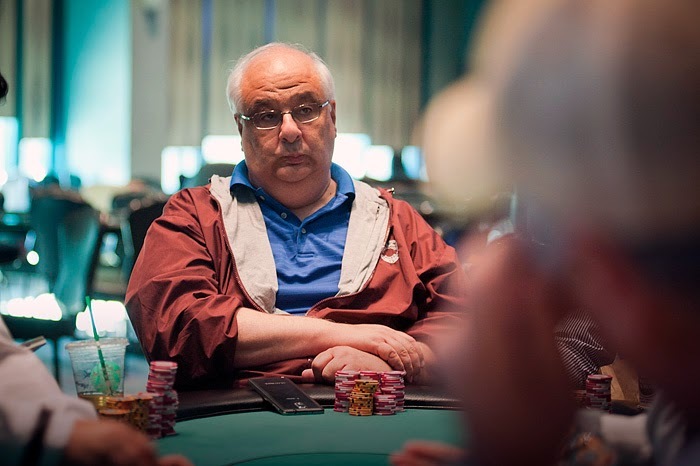 Mark Dube is no stranger to the Foxwoods feature table, in fact he won the $1100 Mega Stacks Main Event on this table last May for over $77,770. 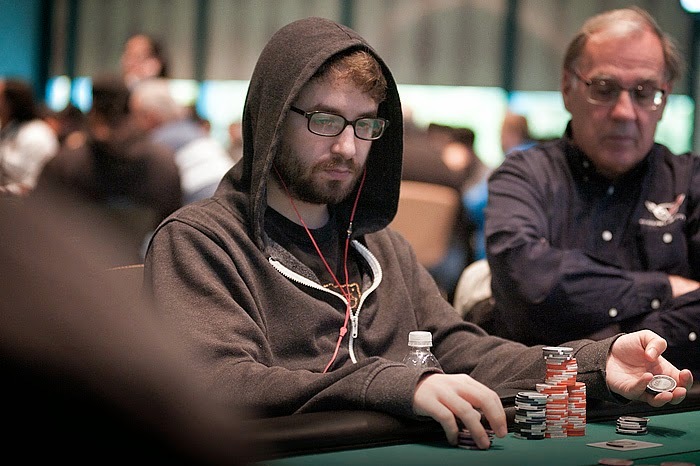 Dube has amassed over $669,000 in lifetime earnings and comes to the feature table with a healthy stack of over 70,000. Follow along live at http://www.foxwoodslive.com ! 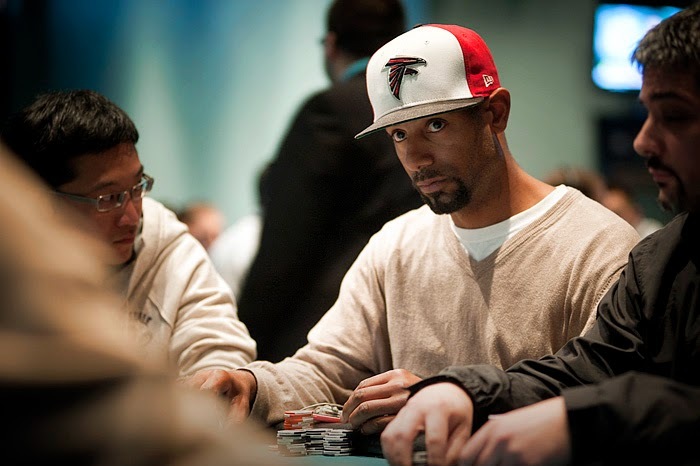 For most people "a chip and a chair" is just an old saying they use when they get short in a poker tournament. For Matt Decker it is a literal description of his tournament thus far. Decker was down to his last 100 from his 20,000 starting stack and after paying the ante only had a single 25 chip left. In just one level he has run that single 25 chip back over 5,000. Players are now on a 20 minute break as tournament officials are walking around and coloring up the green 25 chips. The board reads 274 entries for today thus far and registration is still open til the end of this break. With the board reading [10c][Ad][Qc][8s] a player from middle position lead out for 2,000. 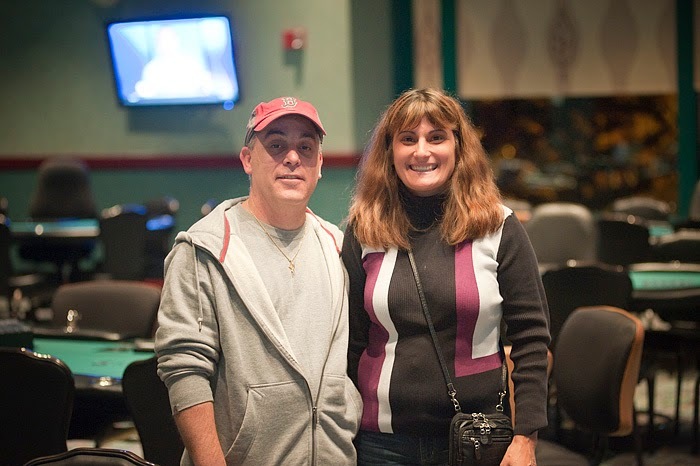 Action was on local tournament grinder Fabio Dagata who elected to put in a raise to 6,000. After a slight deliberation the original bettor announced he was all in and Dagata snap called. Dagata was in great shape to take down the pot with his opponent drawing to only a jack for a chop. The meaningless [10d] hit the river and Dagata scooped the pot worth over 46,000 and his opponent was headed towards the cage for a re-buy. "Guys he wasn't drawing dead, he could have hit a jack for a chop" Degata joked to his table mates. "Seriously, he is suppose to hit a jack there." Players are now on their first 10 minute break of the day. We are officially over 200 entries for flight 1b and still have 4 more levels of registration and re-entry. 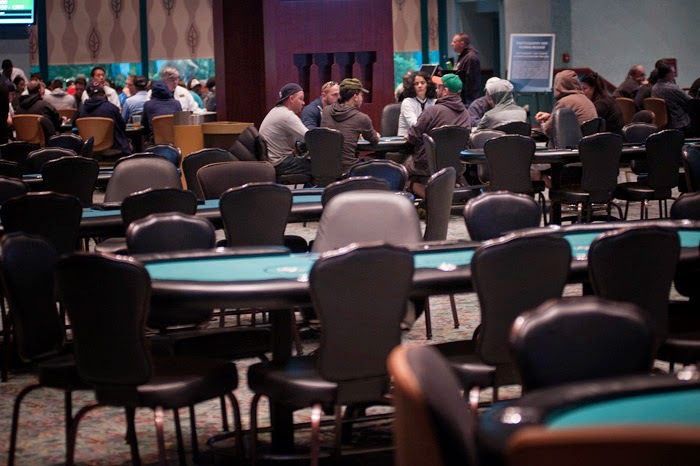 When players return the blinds will be 100/200 with a 25 ante. Bagged 7 bbs in the @FoxwoodsPoker $400 Flight A. Would've had more but a guy decided to spite call off his stack with K9o and got there. Heard it's a best stack forward mtt and I don't know how else to spend $ right now so guess we're trying again in hopes of bagging a pile. 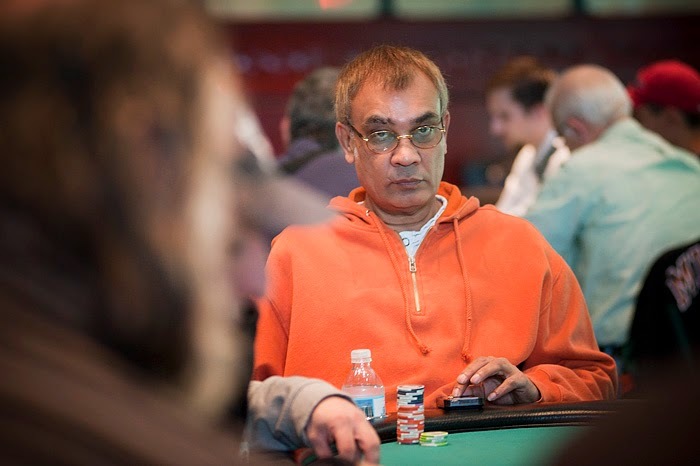 Despite bagging some chips in flight 1A, local pro Tarun G is back today in hopes of bagging a ton of chips. Registration is open through the end of level 8 and we are already close to 200 players in flight 1b. 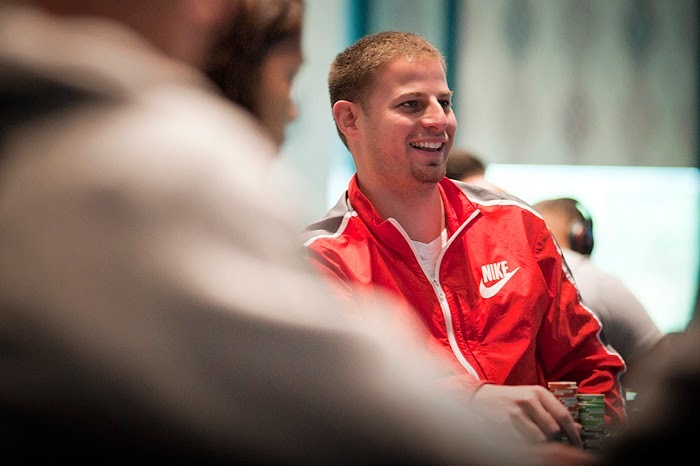 Less than 12 hours after taking down event 12, Nicholas Palma has taken his seat in event 13. Palma already has a second place finish for over $19,000 and a 1st place yesterday for over $40,000 in this series alone. 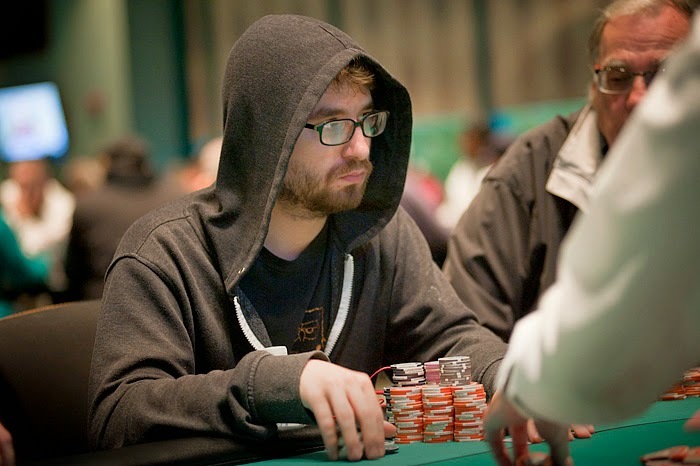 Can he make another deep run in event 13? As the number of entrants continues to grow, a lot of familiar faces have taken their seats. Here is a look at some of the players taking their shot today. We are almost at the end of the second level and we have already surpassed the number of entries from flight 1A yesterday. The board currently reads 140 players who are all taking their shot at the $100,000 prize pool. Registration and re-entry is open til the end of level 8! 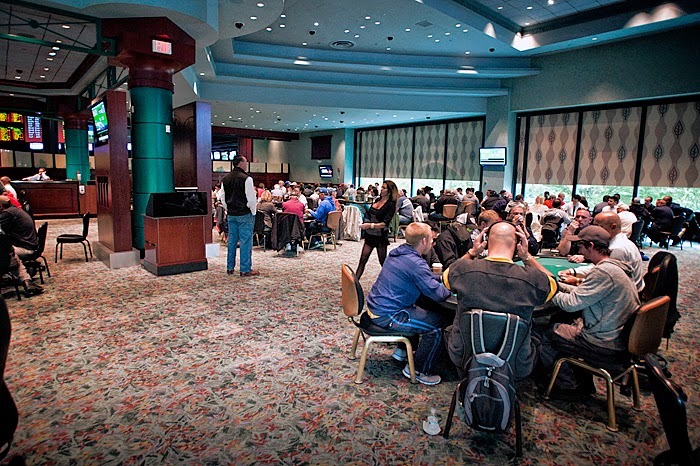 Event 13: We Are Underway on Day 1B! Cards are in the air for day 1b of the $400 NLH. Players will be playing til the end of level 15 tonight and will have until the end of level 8 to register or re-enter. The top two stacks will also collect a bonus for bagging the most chips. The top stack will take home an additional $1,000 and the second biggest stack will take home $500. Good luck to everybody! 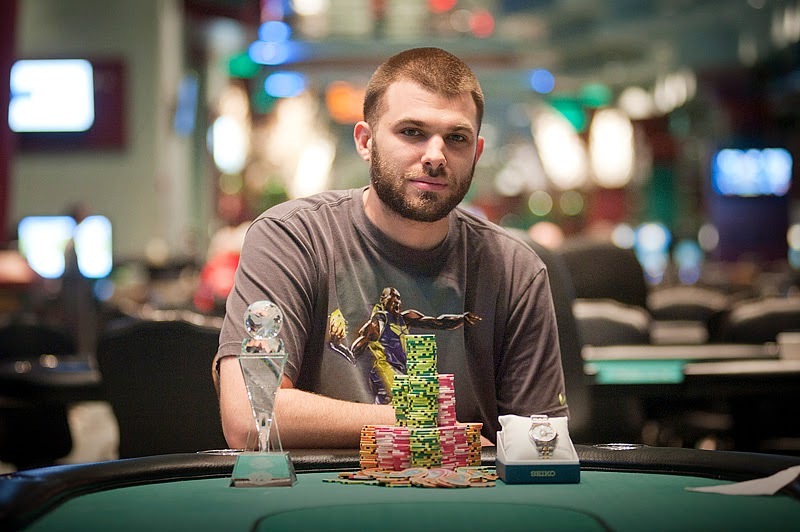 It was no easy battle but at the end of the day Nick Palma takes home the $46,403 along with a new Seiko watch and a Foxwoods Globe. Nick came into the final table 2nd in chips and told the table multiple times it was going to be his tournament to lose. Being a man of his word he stuck to his guns and eventually trucked through the remaining 9 players to take home the win. Domenic Apostolico came into the final table 3rd in chips and proceeded to coast all the way to second place and he did it with a smile on his face the entire time. Domenic will take home $30,301 for his finish here in event 12 and we hope to see him back this week for a few more events!